Brighten up your Christmas tree with cute tree ornaments. 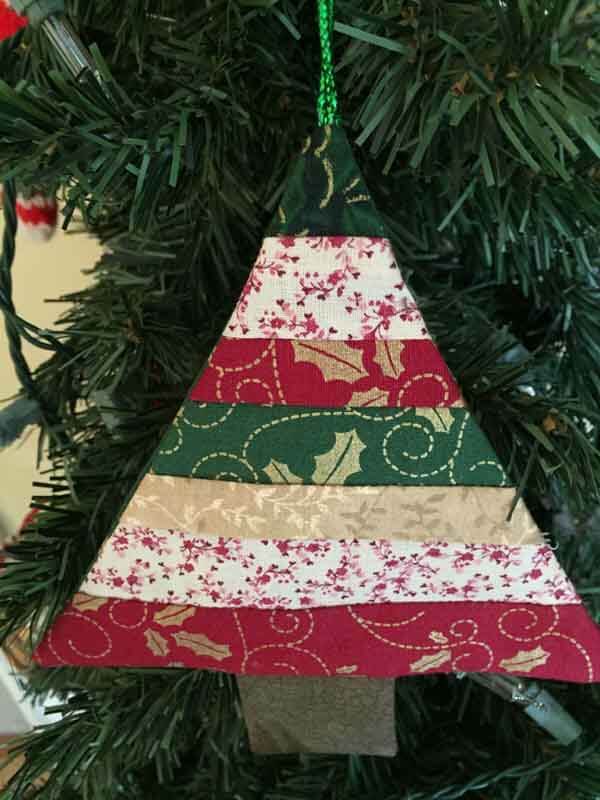 To make this ornament you will learn how to use scrap fabric and strip piece the fabric together to make the strip-pieced ornament. 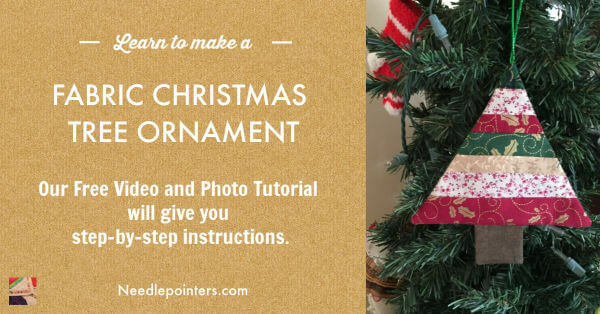 Watch this video tutorial and read on to see how to make tree ornaments. 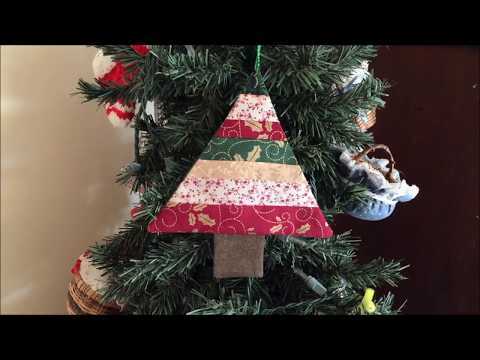 Click to watch the Tree Christmas Ornament video in Youtube. 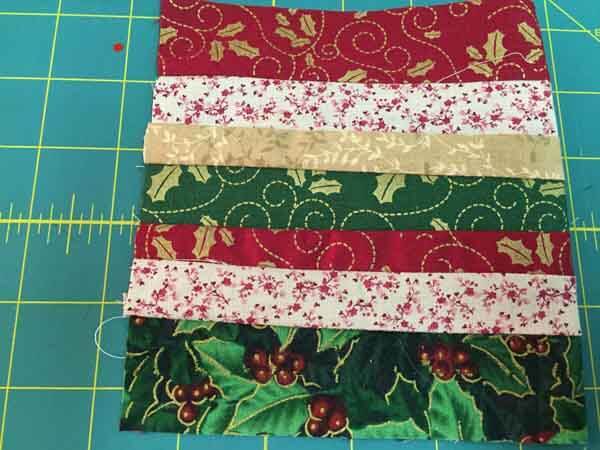 With a rotary cutter, cut scrap fabric into strips ranging in width from 1" to 1 1/2". After strips are cut, begin sewing the strips together. Place strips, right-side together, and sew using a 1/4" seam. Continue adding strips until the pieces measures 5 1/2" to 6" wide. Iron the piece flat and the seams to one side. To cut the tree shape you need a ruler with a 60 degree line. Line up the 60 degree line along the top edge of the strip-piece. The right hand side of the ruler should line up with the bottom corner of the fabric. Cut off the edge piece by cutting along the ruler on the right side. Turn the strip-piece of fabric. Line up the 60 degree line along the bottom edge of the piece and. Cut. You have the triangular piece for the tree. 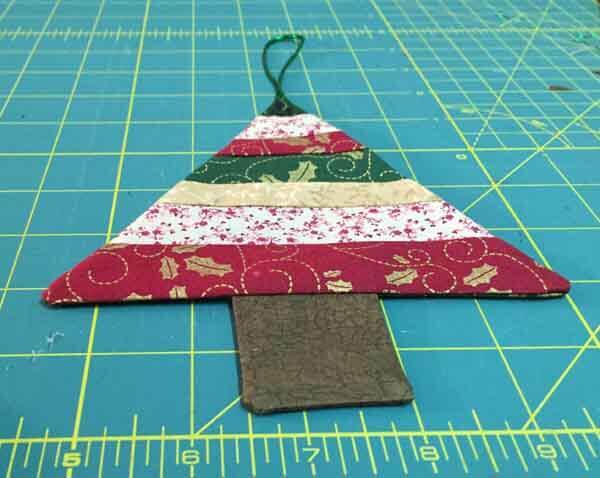 To make the trunk of the tree, cut two pieces of brown fabric 2" x 2". With right sides together, sew along three sides using a 1/4" seam. Clip corners, turn right side out and press flat. 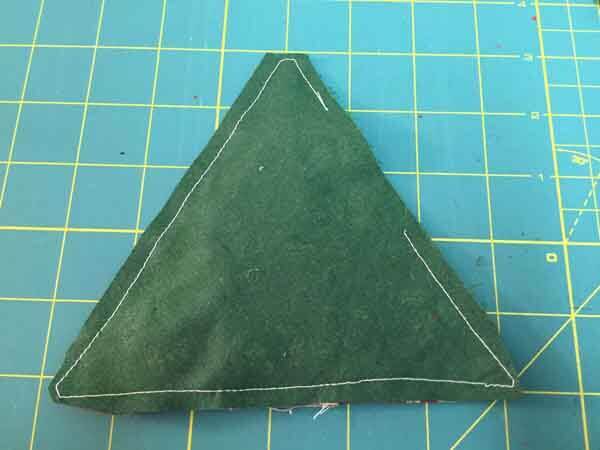 For the back of the ornament, cut a piece of fabric the same size as the triangle. You can cut it from the strip-pieced fabric or a solid pattern fabric. Put the strip-pieces triangle right side up on the work surface. Place the trunk along the bottom of the tree, centering in the middle, with raw edges together facing upward. Pin in place. Pin a piece of cord to the top, facing downward toward the center of the tree. Pin the backing piece on top. Sew around the outside using a 1/4" seam and leaving an opening of about 2" on one side. 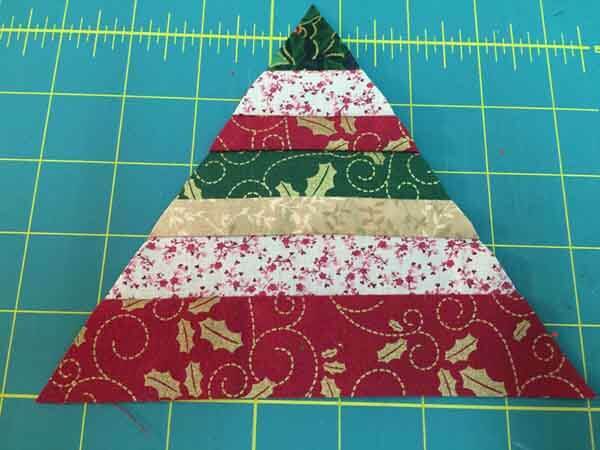 When sewing as you approach the corners, stop and diagonally stitch one or two stitches before stitching the next side. These diagonal stitches will help reduce the bulk in the corners when turning right side out. Turn the ornament right side out, pushing out corners. Press flat. Close the opening by either hand stitch it closed or edgestitch. Edgestitching is stitching around the tree about 1/8" from the edge. Edgestitch tutorial here. The tree ornament is ready to hang on the tree. Happy Holidays! EZ Sewing & Quilting Ruler - 6 1/2" x 13 1/2"